Instead of exercising in the park one evening, a friend and I decided to go out for ice cream. One of the best places to go is called Creams. Located in Dalston it is quite far away from where I live but it is always worth the journey. We have been having some freakishly cold weather in London this week, so it only felt right to get something warm with the ice cream. You could go with a hot tea beverage but we were set on getting hot waffles. My friend went for the Strawberries & Choco Indulgence. Served with strawberry slices (and additional banana slices), this fruity option was drizzled in chocolate and sprinkled with milk chocolate flakes. The fruit was nice and fresh and tasted great with the fluffy warm waffle. The only downside was the chocolate syrup was slightly overpowering. All testament to how rich it was! If you can’t get enough of chocolate this would definitely be my recommendation but it you want something sweet but without killing your taste buds, then why not go for toffee sauce instead? 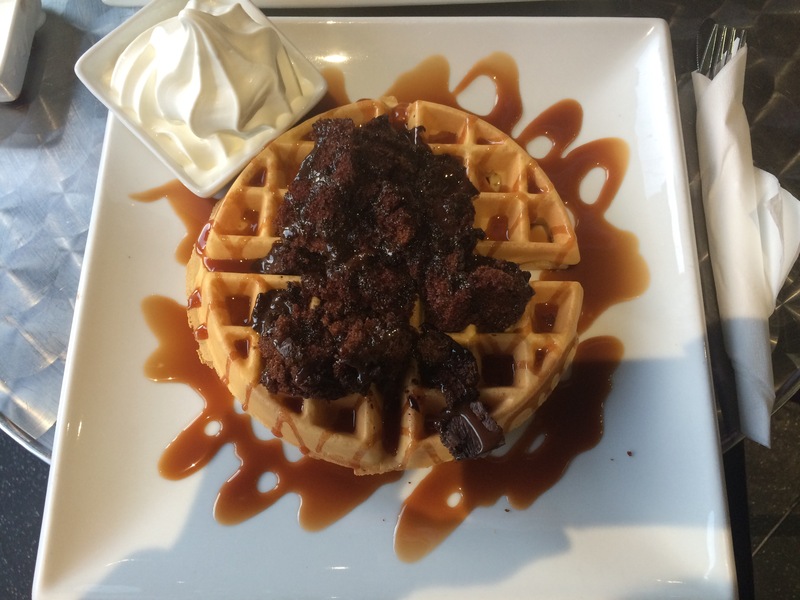 The Chocolate Fudge Mess comes with a waffle covered in crumbled hot chocolate fudge cake and toffee sauce. The fudge cake was hot and moist with just enough chocolate. Combined with the creamy ice cream it was just heaven in my mouth. I completely wiped my plate clean at the end and still wanted more.